In this projects, students will work with Kinect sensor to detect a set of features of body movements. Software includes 3 layers: driver, middleware and a wrapper for the development environment used. MS SDK v 1.8, that includes microsoft drivers. This is valid only for windows, but it allows the use of all the sensor capacities. For the driver OpenNI you can use NITE middleware. Also could be downloaded from here, that includes functionalities as skeleton detection or gesture identification. Kinect4WinSDK. This is the simplest solution to use kinect with processing, as it only needs MS SDK 1.8. It only works in Windows. Visual Stuido for Windows platforms. Video Camera that gives RGB image of 640x480 or 1280x960 pixels, in 12, 15 at 30 fps. 2 IR Cameras - depth data of 80x60, 640x480 or 320x240 at 30 fps. 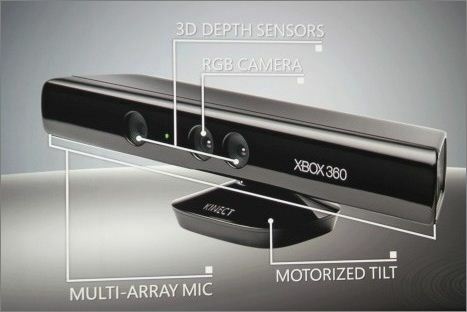 Kinect depth sensor range goes from about 60-80cm to 4-5m. But there is also a projection coordinate system, that is related to what Processing projects to the screen. 3D vector of the skeleton points. Calculate as a normalized scalar value the relative area of the body in the screen respect to the maximum when the user is in "viturbio pose" (value 1), so it is scale prone. Calculate the optical flow using any of the determination methods (see link). You could find help in this reference. From the optical flow, calculate the 3D vector of the total movement of the user. From the optical flow, calculate a set of 3D vectors by zones with a maximum optical flow respect a configurable threshold. The origin of each vector should go from the center of mass of each zone, and would be the sum of the optical flows vectors from each pixel. Make an application that includes kinect in Particles example of Procesing, so the particles source is in one hand. Particle example is in File-Examples-Demos-Graphics. Kinect with Processing introduction that focuses on openNI. openprocessing is a web-site where you can find several Processing sketches.